Successfully Added Voice and Call Recorder for Mobile Phones - Bluetooth, 8GB to your Shopping Cart. 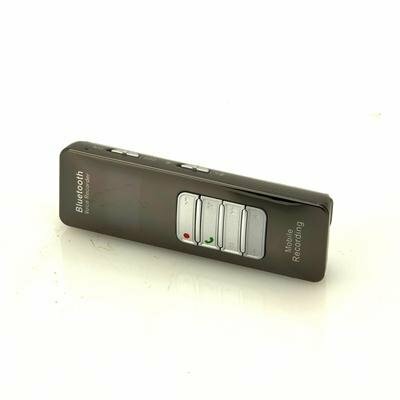 Featuring one-button recording for phone calls and conversations, this Bluetooth Voice and Call Recorder is the easiest to use and most convenient digital audio recorder available. With plenty of features, 8GB built-in memory, and micro SD card slot to expand the memory even more, record everything! This Bluetooth Voice and Call Recorder also has the ability to record mobile phone calls! Simply connect it to your mobile phone through Bluetooth and keep a record of every call that comes in/goes out. Just imagine the uses: Your client calls and wants to negotiate a new contract with you, record the call to make sure you remember all the details! Or your wife calls with a shopping list for tonight's special dinner, record the call so you don't forget anything! There are so many possibilities with this Bluetooth Voice and Call Recorder that you'll be sure to love it for years to come. Available in our warehouse now, buy one today at our low wholesale price and we'll ship it out to you tomorrow. Brought to you by the leader in wholesale electronics. Excellent value! Works as described flawlessly! I would recommend this unit. Good and reliable seller. Fast delivery. The device came as described. I bought this recording device for recording phone calls. But you also have to listen and speak through this recording device. I thougt i could still use my own phone while recording on to this device. Wow, sirve hasta de manos libres, es como un todo en uno, graba por medio de Bluetooth,lector de microsd, micrófono, sirve de medio de almacenamiento, reproductor mp3, el diseño es genial, como regalo no puedes quedar mal con este articulo, para los tecnofilos.